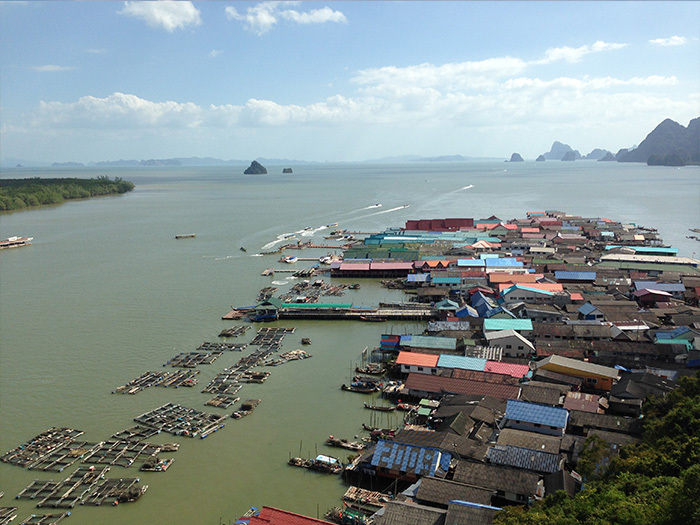 This small island in the nort-western part of Ao Phang-Nga is well known for its Muslim fishing Village built almost entirely on stilts and nestled against a towering limestone cliff. The village appears very commercialised the day when hordes of tourist boats invade to eat lunch at the village's many overpriced seafood restaurants and buy tacky souvenirs at the many stalls. Yet once the tourist boats depart, the village returns to its normal self. The 200 households here - supporting perhaps a total of 2000 inhabitants - are said to descend from two seafaring Muslim families who arrived here from Java around 200 year ago. Ko Pany's primary livelihood remains fishing, since only during the dry season do a significant number of tourists visit. In addition to a big green mosque, a health clinic and a school, you'll find a market filled with small shops selling clothes, toiletries,medicines and all the other usual staples seen in markets all over Thailand - except for beer, liquor or any other type of alcoholic beverage. Besides alcohol, two other things forbidden on the island are dogs and pigs. Houses mixed in with the shops vary from grubby little shacks to houses with fancy tile fronts and curtained windows. The people are generally quite friendly, especially if you can speak a little Thai. Village men often gather to gossip and watch the sunset on the west side of the village near the mosque.